HILLSBOROUGH: Gerald Micol Womble, 76, of Orange County passed away unexpectedly on October 13, 2018 at Duke University Medical Center in Durham. He was born in Durham, the son of the late Gerald M. Womble and Rosalie Micol Womble. Mr. Womble is survived by his wife, Karleen Saunders Womble; and brother, Stephen B. Womble. Mr. Womble graduated from Durham High School and Durham Community College where he received his degree in Mechanical Technology. He worked for 20 years at Chemstrand (Monsanto Co.) in RTP and later as a second career at National Specialty Gases (Air Products). Most recently he worked part-time at O’Reilly Auto Parts Store. 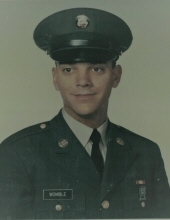 Mr. Womble served 2 years in the U.S. Army reaching the rank of E6 and 2 years in the Army Reserve. He was a faithful Volunteer Fire Fighter with the Eno Fire Department. He was a member of McMannen United Methodist Church, a member of Durham Pistol & Rifle Club and the National Rifle Association, and was a supporter of Judicial Watch in Washington, DC. He enjoyed boating, reading books, sport shooting and spending time with his family and friends after his retirement. A funeral service will be held on Saturday, October 20th at 11 a.m. at McMannen United Methodist Church. The family will receive friends one hour prior at the church. Burial will follow the services in the church cemetery. Flowers are acceptable, or memorial contributions may be made to McMannen United Methodist Church: 4102 Neal Rd, Durham, NC 27705. To send flowers or a remembrance gift to the family of Gerald Micol Womble, please visit our Tribute Store. "Email Address" would like to share the life celebration of Gerald Micol Womble. Click on the "link" to go to share a favorite memory or leave a condolence message for the family.